One board does it all! A wave shape with a huge range of performance. Derived from the all wave board „Campello Wave“ we worked on improving the balance while testing different width to thickness ratios. The slightly wider and thinner shape is more stable and improves the performance in non-perfect conditions. To keep the maneuverability as it was we increased the tail kick and reduced the tail width while adding a winger. The final result is a very polyvalent design which in combination with the 5 fin boxes excels in ease adapting to changing conditions. Offering 8 sizes from 68 up to 113 liters makes this range very complete. The slalom based rocker-line balances out the performance of early planning, acceleration, top speed, control and maneuverability. The very flat nose curve is specially designed to have a better water flow in this normally very curved area. The smoother water flow increases the backward sliding speed for double sliding rotations and the release for backward sliding pop. The reduced nose width improves the rotation speed on the water and in the air. The „kink“ in the tail outline reduces the wetted surface area for increased acceleration, top speed and better pop. The flat panel V still proved to be the best all-in-one bottom shape for early planing performance, great acceleration and top speed and it also ensures the board remains reactive from rail to rail and slides easily for multiple spins. The dome deck under the back footstrap gives essential grip under the feet. At the front footstrap and mast-track area we kept a flatter deck to increase the comfort when riding switch or not standing in the straps. The rails are designed for the best ratio between volume balance, general performance (planning, acceleration, top speed, control), carving and sliding ability. – Side-Onshore and early planing: I suggest Thruster Setup with 220mm in the center and 100mm on the side. – Side off: For wave riding with loose turns and good grip on the top turn I suggest 155mm in the tail and 120 front. As we have US-Box it is easy to slide the fins to adjust for more looseness or stability. Many modern wave boards are equipped with 5 fin boxes, allowing for any fin setup that the sailor prefers. The obvious advantage is that the trim of the board can be adjusted to different types of riders and different conditions (wave size, wind direction and speed, chop vs. flat water). However, the sailor must make a choice. This requires a bit of testing and the availability of different fin sets to choose from. Many sailors probably simply rely on recommendations from the board manufacturer. This may be a good option on average, but if you want to get more out of your board, it is worth playing around with fins to find the optimal choice for yourself. The new Patrik qt-wave is one of these 5 fin box boards. On the Patrik Windsurf Website, you find a very good fin guideline for all board sizes and recommendations in a quad, thruster and twinser setup. I had my first days of sailing the qt-wave on the island of Rømø with wind for a 4.4m2 sail, side-onshore conditions, waves of about 2.5m, and quite some current. I chose the quad weed setup (2 x X-Twin-S 14.5 / 2 x X-Quad-S 8.0) which I used to sail with my former board. With this setup, the qt-wave feels very controlled, allows for snappy turns, and takes a lot of fin pressure. It feels very variable in bottom turns, with a lot of grip on the edge, is very controlled in top turns, but still allows for sliding moves like Takas. That was a good start. The next days, I sailed on the Baltic Sea, with side-onshore wind for 4.4 / 4.0m2 sails and significantly smaller waves. In these conditions, speed is everything to me to allow for proper jumping despite the smaller ramps. Also, I want to reach the top turn with maximum speed in onshore winds. My choice was the twinser weed setup (2 x X-Twin-S 15.5). I was really impressed by the difference this fin setup makes to the board: The board feels faster, a lot “looser” and more skateboard-like. It is noticeably easier to push the board into tail slides, takas, etc. Once sliding, the board is still easy to control, and you can always pull the tail back to get grip on the fins again. 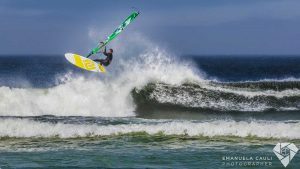 The setup is fast, which is great for jumping, and nicely holds the speed in bottom turns, allowing you to approach the next cutback with max speed. Still, the board feels a bit more nervous, and you might slide too much in top turns if you choose a wrong fin position (too much forward) or fin size (too small). The nervous feeling might be more difficult in high wind / choppy conditions like in nuking Pozo. In big waves with side-off conditions, you would probably want more grip on the rail and in cutbacks to avoid uncontrolled sliding. The next and more extensive testing took place in Chile. We experienced side-off wind with perfect down the line conditions. Sometimes the wind was extremely light, often wobble & ride style, but we also had some sessions being really powered up on 4.6 or 4.0m2 sails. During the first days, the swell size was quite impressive, over mast-high, combined with rather strong wind, often good for 4.6m2. I started with the quad setup (2 x X-Twin-R-02 14.5 / 2 x X-Side 8.0), in order to ensure maximum control in bottom turns and in stronger gusts. The X-Twin-R-02 has more rake than the normal X-Twin, and is a lot softer in the tip. This provides even more control in top turns, less sliding, incredible bite on the rail in bottom turns, and a lot of control in choppy conditions with high winds. It feels a bit as if the board sits a little bit deeper in the water compared to other fin setups, providing maximum control. When the wind decreased for a few days, I changed to a thruster setup (1 x X-Twin-R-02 17.5 / 2 x X-Side 11.0). This has proven to be the most powerful fin setup that I have tried. Very early planning, excellent acceleration for jumping, and good grip which gives a very secure feeling in bottom turns on bigger waves. Also, for carving top turns, the fins provide a lot of drive. The downside is, that the board feels significantly less loose in cut backs, and I had to push a lot harder compared to other setups, to go for radical top turns. Interestingly, my friends travelling with me – and weighing about 20kg more than I do – loved their thruster setups. Potentially, the disadvantages are less noticeable for heavier riders, and you might compensate these by choosing a slightly (1cm) smaller center fin – which I did not have in my bag. When the swell decreased a little, I switched to a twinser setup – 2 x X-Twin 16.5. This changes the board into a real skateboard. Super loose, very fast and agile, and the board seems to sit a bit higher on the water. It is very variable in bottom turns, reacting very fast and allows to change the radius at any time. Furthermore, this setup is the best for skating moves on the wave, and thus a lot of fun in lighter conditions, when waves are smaller and you are not stacked on small sails. The disadvantage quickly becomes apparent when the wind increases significantly, and the waves become higher and more powerful. The board tends to feel more nervous and a bit less stable on the rail – so you might miss the last bit of confidence especially when the waves are pumping and when it becomes really choppy. 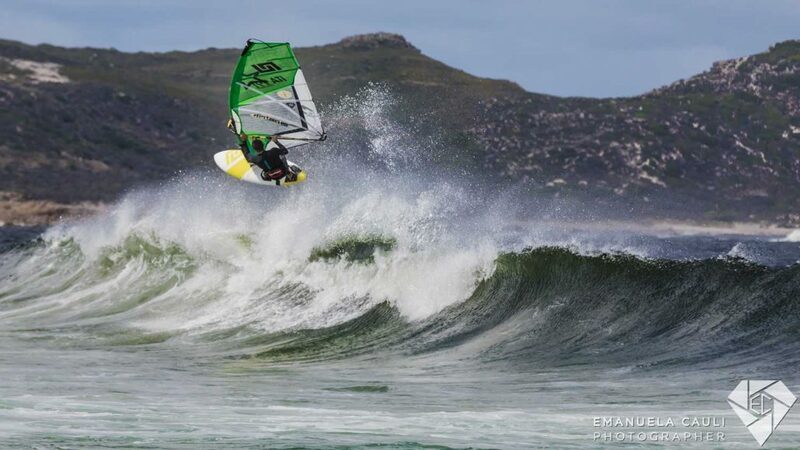 In side-off / down-the-line conditions, I would recommend a quad setup for lightweight riders, in any wind and wave size. Heavier riders should take a close look at thruster setups instead. Lightweight rides using a thruster board should experiment with the center fin size if they feel the board could be more maneuverable. In typical northern European onshore conditions, like at home on the Baltic Sea, I would recommend a twinser setup. Only when the waves become bigger and the wind really strong, meaning 4.0/ 3.6m powered up, I would propose to change to a quad setup for improved control. Once you decide which character is the best for you, you can still play around with different fin types, fin sizes and fin positions. It pays off! But in the end, I am convinced that you can make all of the fin setups work in all conditions, and I would encourage everyone at least to test different fin positions. The impact on the board characteristics are amazing, and you should try to use the versatility of 5-box wave boards to your advantage.